Cigarette smoking has become significantly less popular in the U.S. over the past decade, it still remains a public-health scourge. Smoking accounts for more than 480,000 deaths every year in this country, or about one of every five death, according to the Centers for Disease Control and Prevention, while an additional 16 million Americans live with a smoking-related disease. Clearly more needs to be done to get Americans to quit smoking. Some say electronic cigarettes can help wean smokers off tobacco, as little risk to their health. For others, both of those assertions are false. A 2011 appellate court decision confirming that e-cigarettes were to be regulated by the FDA was really a victory for American smokers. Why? 1. The decision guaranteed that e-cigarettes would remain on the market. 2. It assured that e-cigarettes would be subjected to general controls that would promote the marketing of safe and quality-controlled products. 3. It allowed pharmaceutical companies to develop more satisfying nicotine medicines that could be used as recreational (and low risk) alternatives to cigarettes. An event at The Heartland Institute on Wednesday, April 20 was all about E-cigarettes and vaping as a low-risk alternative to tobacco products. The youtube video of the program can be viewed here. 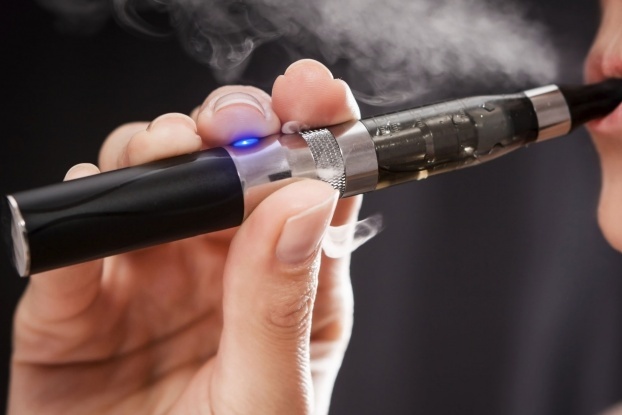 E-cigarettes are battery-powered devices that vaporize a mixture of water, propylene glycol, nicotine, and flavorings. They are activated when the user inhales through the mouthpiece of the device, delivering a small dose of nicotine without any of the carcinogens derived from the combustion of tobacco that occurs in cigarettes. Featured speakers at Heartland’s event were Brian Fojtik and Victoria Vasconcellos. Both guest speakers took a pro-stance position on e-cigarettes as a safe and effective smoking cessation aid. Fojtik’s career includes work in both the public and private sectors. He received his undergraduate degree from the University of Wisconsin-Madison and his law degree from Loyola University of Chicago. Presently Mr. Fojtik is a Senior Fellow for the “Reason Foundation”, a free market think tank. Victoria Vasconcellos is a former long-time smoker and owner of Cignot Inc., established in 2009. Ms. Vasconcellos is also a founding member of the Illinois Chapter of the Smoke-Free Alternatives Trade Association. SFATA is the Voice of the Electronic Vapor Industry. Vasconcellos’s mission is to insure that smokers receive support and affordable access to what she considers a life changing option to smoking. As a pathway for CASAA to expand its networking opportunities, in March of 2015 Ms. Vasconcellos was appointed as one of ten individuals to the newly created external CASAA Board of Advisors. Introduced by moderator Jim Lakely, Communications Director at the Heartand Institute, Brian Fojtik wasted no time in praising Brad Radu, Heartland’s own Senior Fellow, who holds the Endowed Chair in Tobacco Harm Reduction Research at the University of Louisville’s James Graham Brown Cancer Center. Radu’s research focuses on the substitution of safer tobacco products by smokers who are unable or unwilling to quit smoking with conventional cessation methods because of their addiction to nicotine. Five of Rodu’s excellent, informative articles will be shared at the end of Part 2. All are noteworthy and well worth the extra time to read. Also highly recommended by Mr. Foitik was Dr. Michael Siegel, a well-known and very highly respected professor at the Boston University School For Public Health. Dr. Siegel is regarded as a tobacco control expert. Siegel is further recognized as a strong voice for taking a stand against the sham methodologies of anti-vaping groups who deceitfully deploy scare tactics to misinform the public about e-cigarettes. In this article Dr. Siegel stands up to anti-vaping shams. As one who smoked for 28 years before vaping, Brian Fojtik spoke of preferring flavors to tobacco and menthol, noting that those bothered by the fun flavors associate them with flavors children might find fun to use. Available evidence support the view that e-cigarettes are reasonably safe and far less risky than cigarettes. As exaggerated health concerns about e-cigarettes sound sensational, they are covered that way widely by the press. Early reports suggested that e-cigarettes produce formaldehyde. Since the formaldehyde component of cigarette smoke has been estimated to raise smokers’ risk of cancer by less than 1 part in 1,000, the amount found in e-cigarettes is indeed insignificant, as e-cigarettes release far less formaldehyde than tobacco cigarettes. It is the combustion of tobacco and the 4000 chemical substances that are produced when smoking cigarettes that are harmful to health of smokers, not the nicotine. As such the U.S. Surgeon General and other experts have linked the vast majority of diseases associated with smoking to the combustion products of smoke, not to the nicotine that is present. The dangers of electronic cigarettes are considerably lower than those of tobacco. From analysis of the constituents of e-cigarette vapor, e-cigarettes can be expected to be at least 95 to 99% safer than smoking tobacco cigarettes in terms of long-term health risks. The vapor exhaled from e-cigarette users is highly unlikely to be harmful to bystanders; nicotine concentrations in exhaled vapor are too low to have pharmacological effects on bystanders. The vapor produced by e-cigarettes is simply not comparable to the thousands of toxic agents formed when tobacco is burned. Randomized controlled trials show that e-cigarettes are effective in smoking cessation and studies of the use of e-cigarettes in real world settings show that they are more effective than other means for stopping smoking, including Nicotine Replacement Therapy. Battery safety is a legitimate issue. No studies have been done relating to long-term daily exposure, but smokers shouldn’t wait to vape. Check this article by Clive Bates in which he presents 24 arguments related to e-cigarette science, policy, and politics in a Question and Answer format which supplements preceding bullet points. Clive Bates was cited by speaker Brian Fojik as an importance e-cigarette pro voice. Clive Bates, as was guest speaker Victoria Vasconcellos, was appointed to the newly created external CASAA Board of Advisor. In the past Bates served as a Director General with the Welsh Government and also in its Department of Energy and Climate Change. In September of 2014, Clive Bates contributed this fine article to the “Pharmaceutical Journal” (A Royal Pharmaceutical Society Publication): Stop demonizing a potentially useful product for smokers. Needless to say, even when scientific studies so far have concluded that e-cigarette are safe, those who are against e-cigarettes will bring up the “risks to the population” argument. Often the result will be to ban the product until it can be proven safe. The gate-way argument that an e-cigarette smoker will get hooked on nicotine and start smoking tobacco cigarettes has been disproved. Most individuals who use e-cigarettes do so to move away from combustible tobacco, not toward smoking. Part 2 will be based on The Heartland Event about e-cigarettes and vaping, but it will also give additional insight into the controversy over e-cigarettes v. tobacco products. Questions addressed include: What does England have to say about e-cigarettes? How did the war on vaping get started? Why FDA approval of new products are prohibitive in cost and timely to receive and thus out-of-reach for the vaping community? How pharmaceutical companies receives breaks in taxes? and How is Chicago dealing with e-cigarettes?